Our illustrious Moscapoet has written a wonderful review on Hibernia. He has quite a way with words in describing the Hibernia listening experience. His degree in History allows him to expound on some of the meaning of “Hibernia” and what it means to Máiréad. I’m just an over-the-hill rocker, so my knowledge of classical isn’t as wide ranging. My degrees are in Recording Engineering and Entertainment Business. I’ve spent the last quarter century working in music production and teaching the same. So I thought I might write a review to cater to the “tech geeks” and give my thoughts on why the production on Hibernia sounds as good as it does. Trust me, this was no accident. Now in the past, I’ve had the pleasure of discussing “tech talk” with Máiréad, albeit on a very limited scale. As Scott has mentioned, she does have production credits under her belt. I have not, however, had the opportunity to discuss the production of Hibernia with her. So my insights here are gleaned from the updates she’s posted combined with my own personal experience. So there is a degree of speculation, but I think I can get pretty accurate. I hope so. If she reads this and comes to the conclusion I’m talking out of my rear end, she might whack me with her bow the next time I see her. Love ya, Máiréad! Most, if not all, of us are familiar with her early release, “Raining Up”. It’s a wonderful album. As Scott mentioned, she revisited some of this on Hibernia. He also said it sounds “deeper and richer”. He’s right. And there’s a very good reason for this. They really pulled out all the stops in the production of this album. 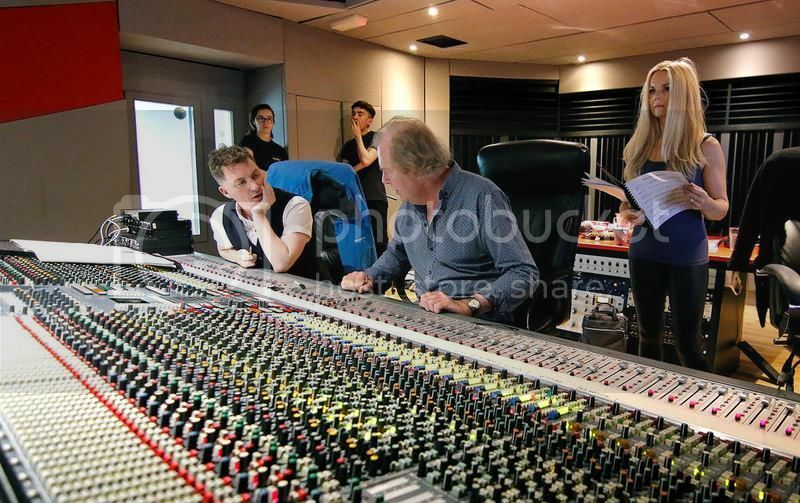 Máiréad knows what she’s doing and the producers like Colm, Brian and Liam do as well. In my opinion, the difference between “Raining Up” and “Hibernia” is the tools they had access to. But it’s not just having access to the “tools”. You have to know how to use them. And these guys have well proven they do. The room is very important in getting a great sound. There was also the challenge of finding a nice sounding room large enough to track a full orchestra. For this, they wisely chose Windmill Lane studios in Dublin. Their flagship room is large with reflective surfaces to make the orchestra sound big and lush, yet designed acoustically correct to eliminate problematic phenomena such as standing waves and flutter echoes (as opposed to say, a warehouse). These rooms are not cheap to design and build. As such, access to a room like this is not cheap either! I checked. This room runs approximately $1000 a day (give or take depending on the current exchange rate)! 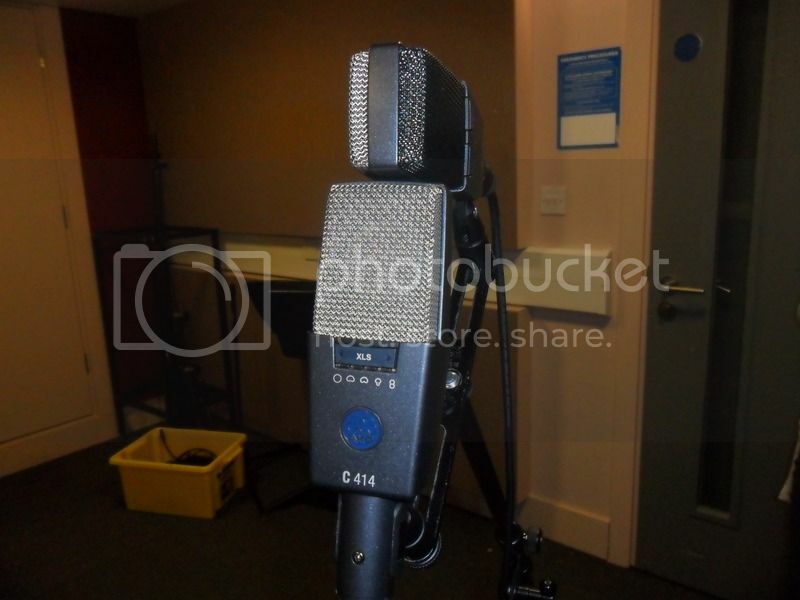 The other asset of this studio resides within the control room, and is also a main contributor to the sound of Hibernia. 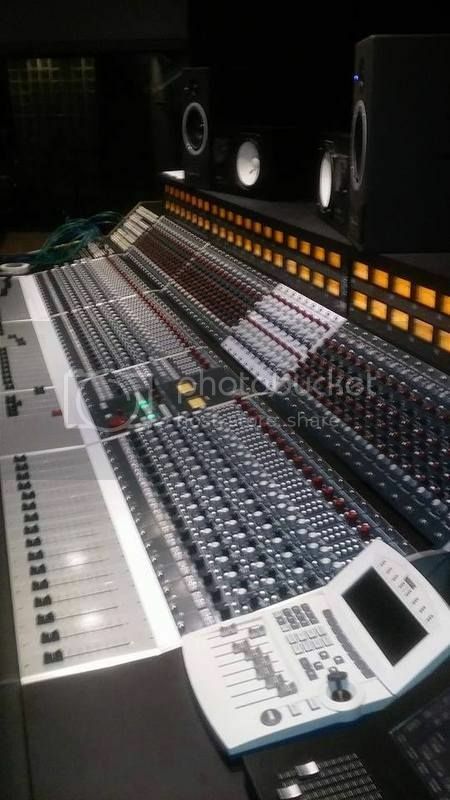 That would be a classic Neve VR series console. Rupert Neve is one of the most renowned console designers in the world. The circuitry he uses in his preamps is a closely guarded trade secret. The warmth of the sound of a Neve is legendary. I know the VR series very well. We had one here at the University, and I taught students on it from the mid ‘90’s to the early 2000s when it was retired and replaced by an Amek 9098i (also designed under contract by Rupert Neve). It’s one of my all time favorites of all the consoles I’ve worked on. Now to be fair, by industry standards, the VR series is considered by many to be obsolete. That’s because most recordings nowadays are being recorded to a computer program. The VR series was popular during the ‘80s when analog recording was still standard and you needed a large, convoluted console to handle routing of all the numerous tracks. Consoles popular now are more of a throwback to the simpler 8000 series popular in the 70’s as the tracks can now be more easily handled and arranged within the computer. In fact, our Amek 9098i was retired over the Christmas holidays and replaced with a brand new Neve, but with a much more simple design. But again, I suspect this is also what led to the decision to use Windmill Lane. 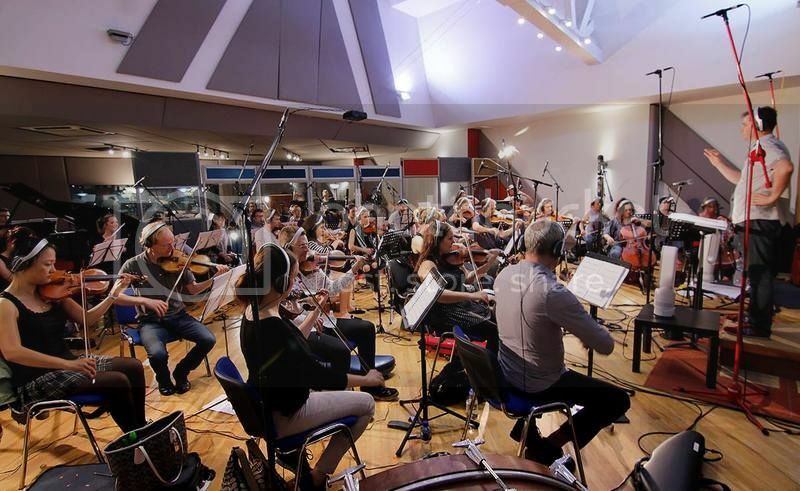 As mentioned, Máiréad needed to record a full orchestra, a task where the massive VR series really shines! As I said, they knew how to use these tools. And this is reflected in the subtlety of the photos I’ve seen. The “sweet spot” when micing a violin is at about a 15 degree angle to the soundboard of the instrument. My gut reaction would have been to use closer micing for more isolation. But in the photo below, you see the wisdom implemented. If you have a well designed large room, why not take advantage of that with more distant micing to allow the sound of the violin to “breathe”? There was another micing technique that was used for violin overdubbing in a smaller room at some point. I saw a photo somewhere on social media where the MS (“middle-sides”) stereo micing technique was used. Now I can’t remember if this was a photo of the Hibernia overdubbing sessions or the Devil’s Bit sessions. In any case, it was a smaller room. This is a technique where you use two large diaphragm condenser mics and mount them so as the diaphragms are perpendicular to each other. The “sides” mic is switched to a bi-directional pattern with the phase on one side reversed. The “middle” mic is switched to a cardioid (directional) pattern. This technique allows more control of the stereo spectrum and allows for a more lush sound in a smaller room. I know I saw this photo and even commented on it, acknowledging the technique. But now I can’t find it anywhere. Did I divulge a trade secret and it got deleted? Oops! (again, love ya, Máiréad!) Actually, I feel I can discuss it because it’s not really that secret. It was first implemented by EMI engineer, Alan Blumlein back in 1933 (uh-oh, my “teacher” is showing). So as you can see, nothing was spared. No corners were cut in the production of this album. And it shows! Criticism? The only thing I can say is if I had mixed it, I might have backed off on the flutes on “Hallowed Fire” just a wee bit. But that’s entirely subjective and my taste only. I’m sure it was exactly what they were going for. Am I saying I could do better? Absolutely not! As you can imagine, mixing an orchestra is an extremely daunting task. And they did an impeccable job! Note the room uses a lot of wood paneling. This is not just to make it look pretty. The wood enhances the sound. The massive Neve VR series in all it's formative glory! By comparison, our brand new Neve just installed. Note the simpler design. An internet photo I grabbed of the MS mixing technique. I swear I saw a production photo where they were using the same technique, right down to the same AKG 414s. An informative and fascinating read. It makes me appreciate the album even more! Thank you, Tom! I'm glad you liked it. Thank you for the tech perspective, Ron. I always liked reading that when you used that angle on the CW shows. Certainly not a run of the mill review. As Mr. Spock would say, "fascinating". I appreciate that, Scott. In the words of David Grohl: "Rupert Neve is @$&%ing Genius!" 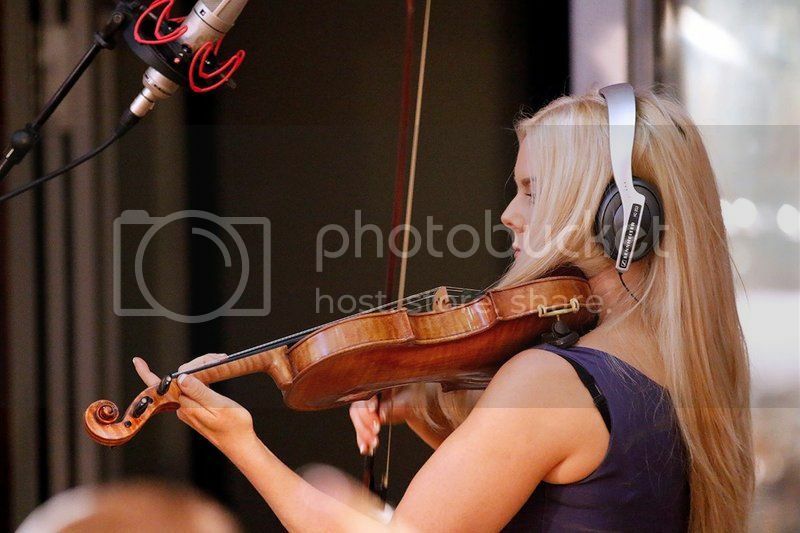 Oh, and speaking of professional brands, did you notice the name on the headphones Máiréad is wearing? Yeah, Saw the headphones. Very cool. And Tony and I just watched Sound City a couple weeks ago. He likes the tech stuff too. Yours are nicer though. More expensive model.